What this raucous 3D animated fun house lacks in originality, it makes up for in visual and vocal wit. Adam Sandler uses a hilarious Hungarian accent to voice the role of Dracula, and he is surrounded by the likes of Andy Samberg, Selena Gomez, Kevin James, Steve Buscemi and even David Spade. What won me over from the start was the character design: the film is populated by fancifully exaggerated versions of The Mummy, The invisible man, The Wolfman and The Frankenstein monster. That’s half the fun really. The plot follows Dracula and his quest to keep his daughter Mavis safe from the outside world. On her 118th birthday, she asks her father to allow her to step outside the safe confines of the Hotel he built, but Dracula has other plans for her. Then out of nowhere, a dopey college dude stumbles upon the Hotel and threatens to ruin everything. To be completely honest, there’s nothing truly great about the plot, but it moves along at a steady clip, only inviting mild criticism when it goes into overdrive during the climax. 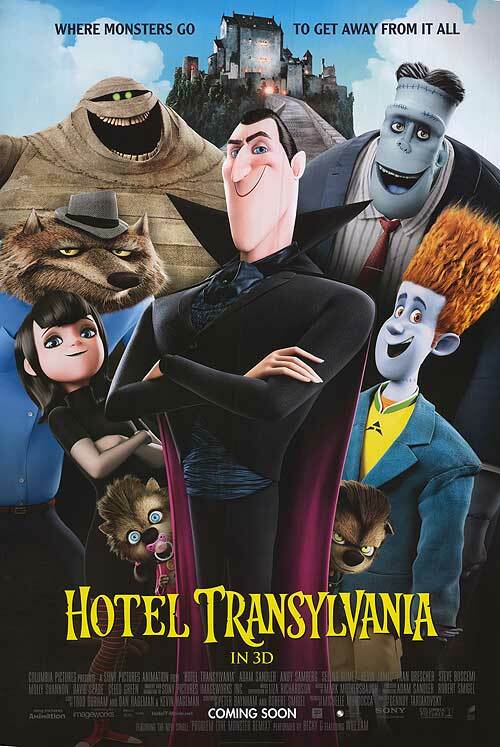 But overall, “Hotel Transylvania” provides seamless entertainment for the young and the young-at-heart. There were a few dozen young children at the screening I attended and they were all laughing and cheering; that’s always a good sign. it has its funny moments ! keep up with you. Could you make a list of the complete urls of all your shared sites like your linkedin profile, Facebook page or twitter feed?